World Otter Day is just around the corner! What do you have planned? 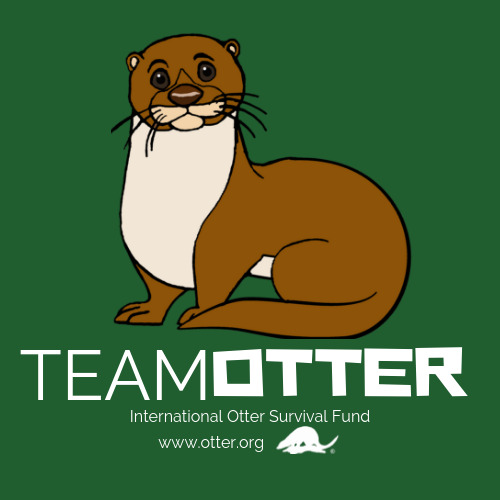 Run an event in your school, do a bake sale to raise money for otter conservation or many more! 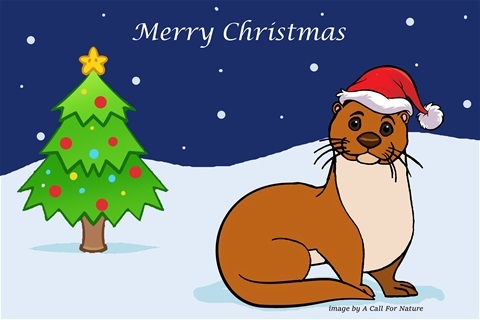 You can even do ottery art or an ottery song and send it in to IOSF to have it put on our website. 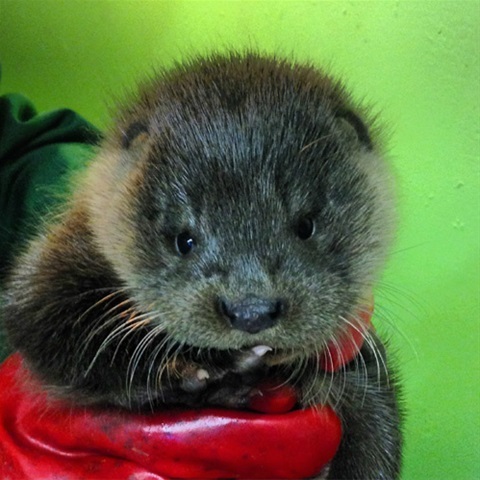 Here is our 6th otter but he has no name! We have teamed up with Broadford Primary School to choose a name and need your help picking a winner. Visit the Resources page for our education pack and kids leaflet! 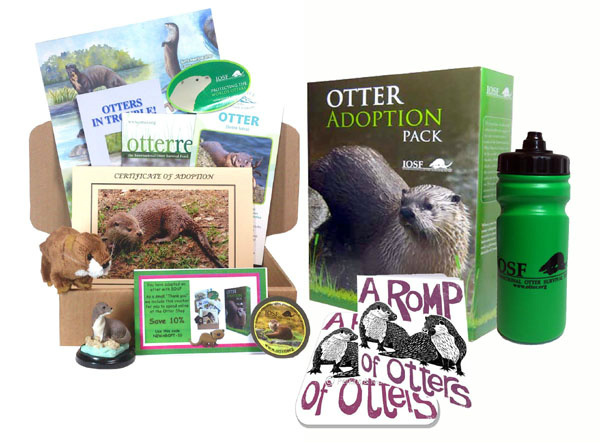 Check out some of our ottery presents and items you can get! 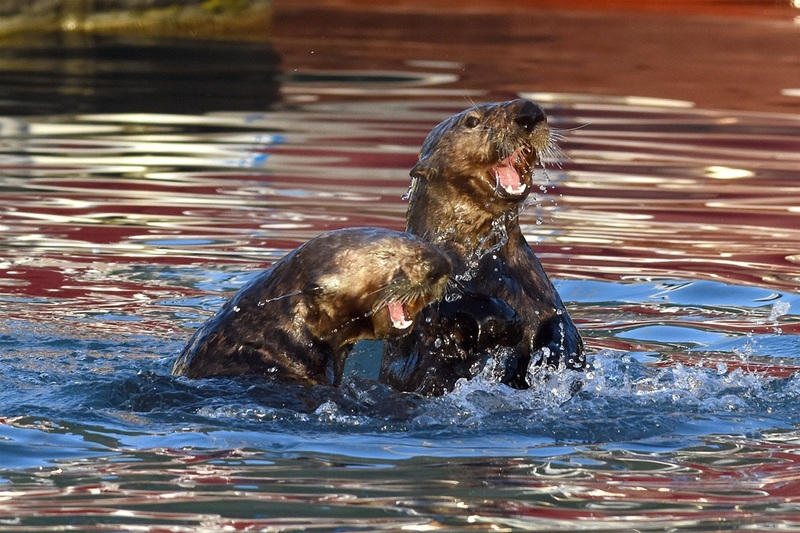 Watch as this mother and cub have a play-fight outside their holt. We have been monitoring these two otters for a while now and they never fail to offer some sort of entertainment. 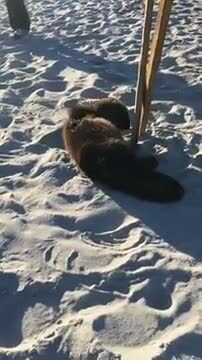 IOSF's youngest otter Oscar II continues in his rehab. He has since moved outside and is very independent. We rarely see him and only do so infrequently to 'check-up' on him. Have you done something special for otters this year? Maybe you know a friend, family member or classmate that has. 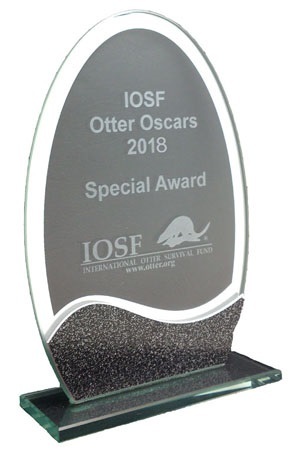 Click here to nominate yourself or someone else for an IOSF Otter Oscar. We love to recognise people that do special things for otters and this is your chance to put someone forward for that! 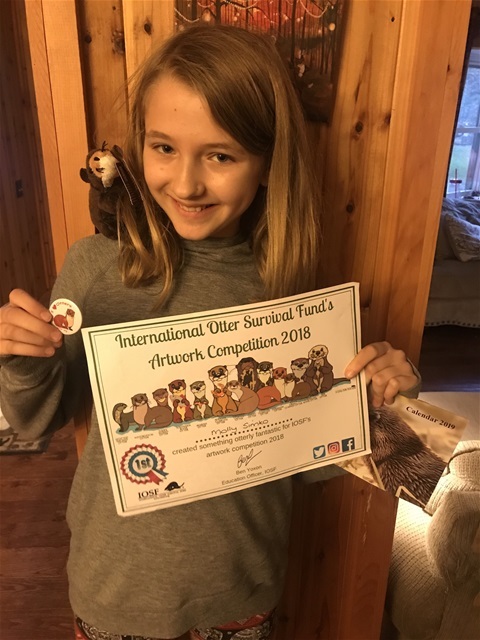 Molly Simko, pictured, proudly displays her prizes after winning IOSF's Otter Artwork Competition 2018. Her picture, below, was chosen among many other great pieces of artwork as this year's best. Congratulations to Molly and a massive thanks to all the other entries this year. 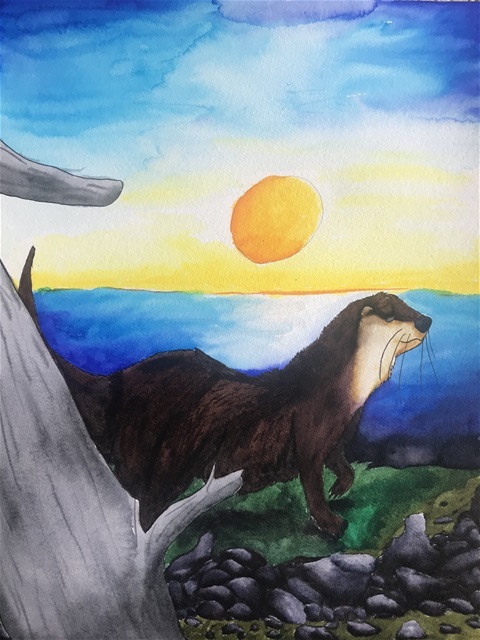 Congratulations to Molly Simko, aged 11, from Pennsylvania, USA for winning this year's IOSF's otter artwork competition. After a very tough decision with some excellent pieces of artwork Molly's picture, right, was chosen as the winner. Thanks to all this year's superb entries. One of the best things about looking after otters in when we get to release them. 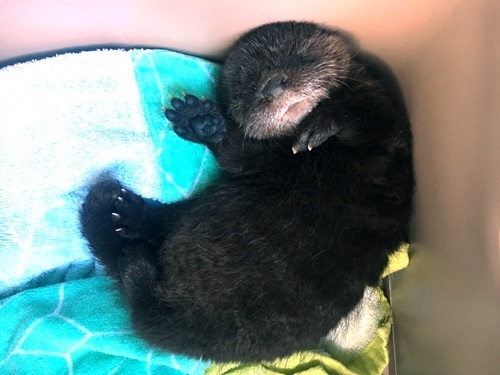 Otters are wild animals and they are only ever in IOSF's care until they are okay to go back where they belong, the wild. This video shows the release of Ray on a beautiful afternoon. We all agreed that this is one of our best releases and it was with great happiness we said our farewells to Ray! All this dry weather has meant that we have had to use a hose to fill otter pools. Beatha, one of IOSF's otter cubs, has particularly enjoyed this. Beatha loves playing under the hose as shown in the video and will be hoping that the wet weather doesn't return! A day to celebrate how amazing otters are and how they can help us and we can help them! 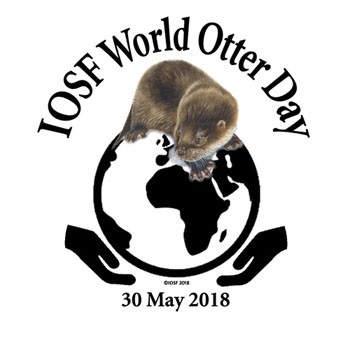 Thank you all for all your wonderful events and helping us make this IOSF's World Otter Day the biggest one so far! What happens when two of South America's most ferocious predators come head to head. Who do you think will run away? 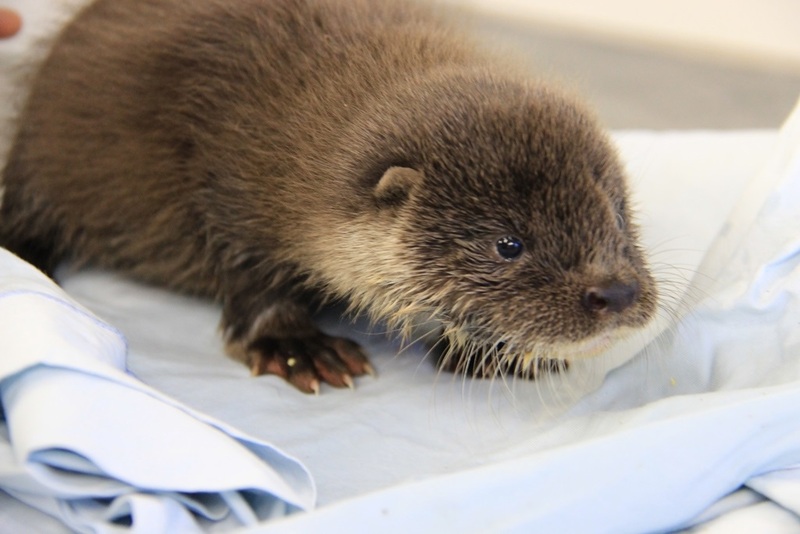 There have been a couple of movement's with IOSF's cubs at the otter rehab and release centre. Uisge has now moved up to the large croft pens. He will now stay there until his release. This pen is large and away from people meaning will have minimal human interaction which will ensure he retains his wild nature. Mel, the youngest of our cubs has moved from his inside cub unit into the pen vacated by Uisge. Very inquisitive at first, inspecting his whole pen, Mel has now settled into his reserved nature where he hides under his bedding. Can you come up with the best caption for this photo! Email ben@otter.org with your entries! 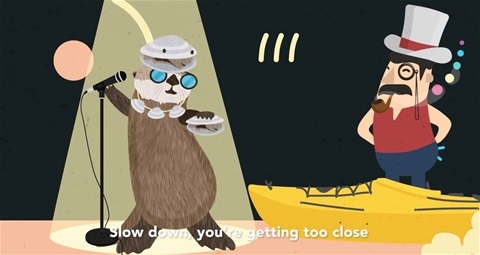 Wild Lens and Sea Otter Savvy have produced a short film to educate on how to interact with Sea Otters without disturbing them. Although this video focuses on Sea Otters it is true for all other species. Always maintain a safe distance between yourself and otters to ensure the safety of both. 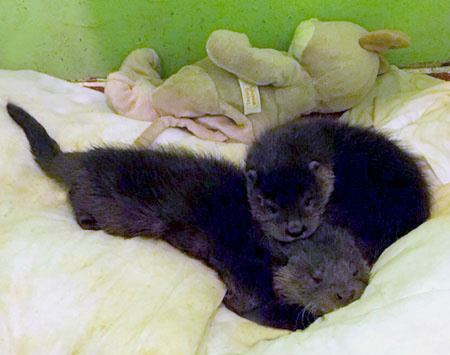 Watch as these three Eurasian otters in Scotland feed. 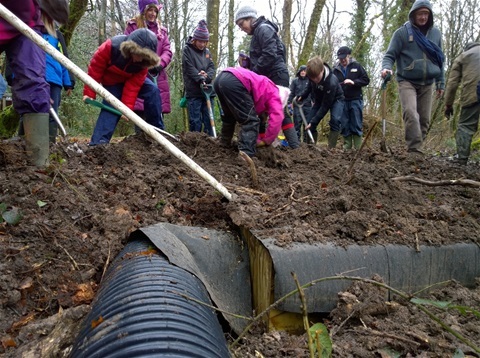 On Saturday 10th February Somerset Earth Science Centre held an otter event inviting children and adults to join in their activity. 25 kids and 24 adults, as part of the East Mendip Wildlife WATCH group, attended learning more about otters, including trying IOSF's quiz. During this activity an artificial holt was built on the lake for otters to use. There are otters signs around the lake so let's hope they use this new home! Our Female Otter has a cub! IOSF has been monitoring this female on the Isle of Skye for some time now. Now, she is a mother! 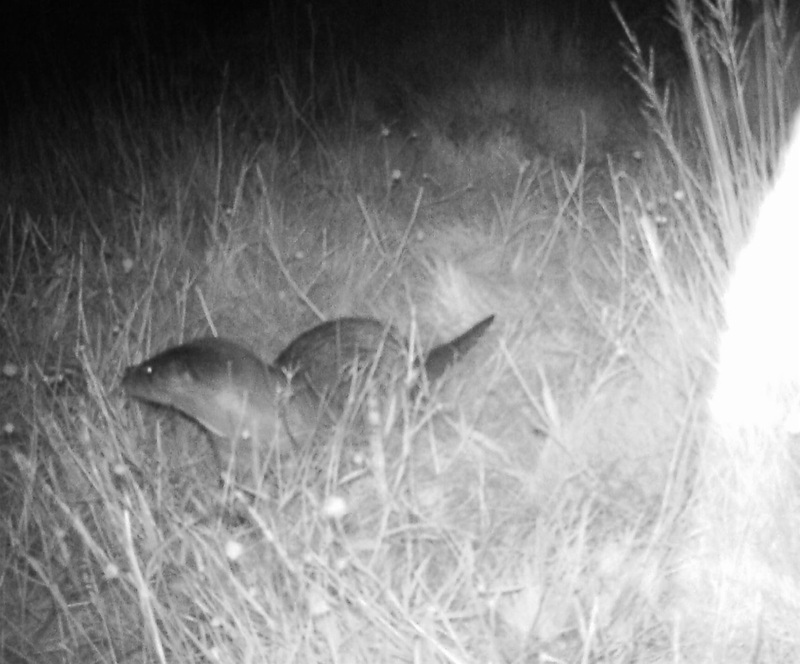 Our latest camera trap video shows her and her cub playing near to their holt! 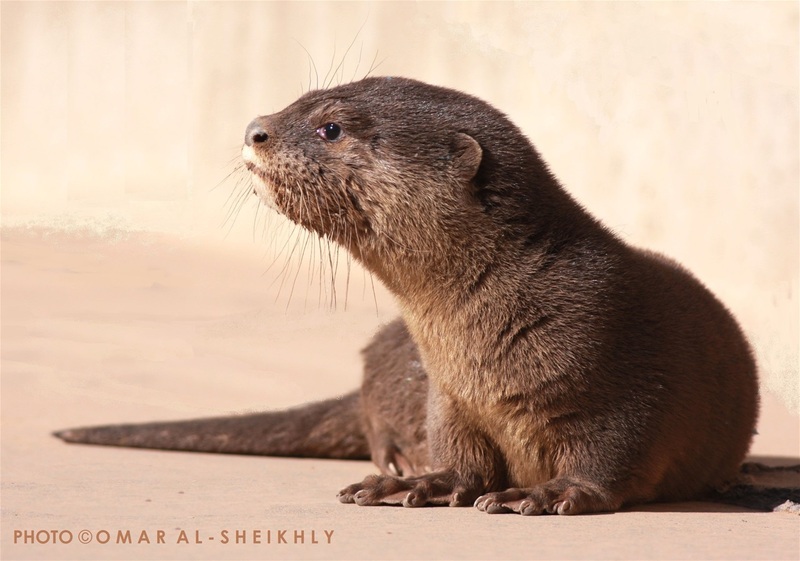 We are pleased to say that the rare Maxwell's Otter Cub that was taken to our Middle Eastern Coordinator Omar al Sheikhly is doing well and growing! 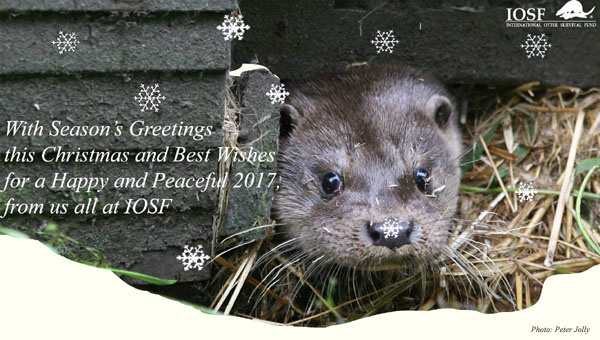 IOSF would like to wish you all a very Merry Christmas and Happy New Year! This young Sea Otter managed to escape a shark attack. Found on a beach in Carmel, California the cub was taken to Monterey Bay Aquarium to be looked after. The young cub was given antibiotics and fluids. We will keep you updated on how this little man gets on. IOSF has launched an appeal to upgrade it's otter facilities. Click here to find out more! One of the world's busiest airport was brought to a halt thanks to a family of otters. 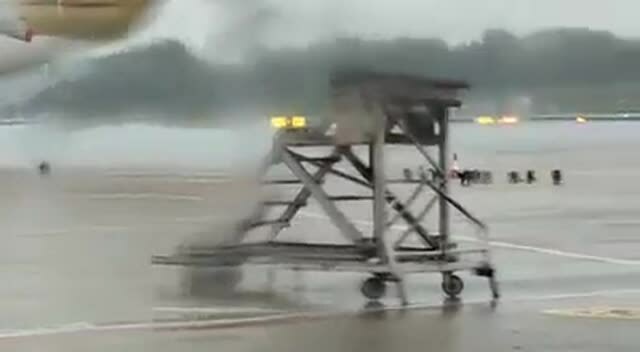 Singapore's Changi Airport had to stop flights temporarily as these otters seeked refuge from the rain under one of the planes. Eventually, the otters were ushered off the runway and normality resumed at the airport. 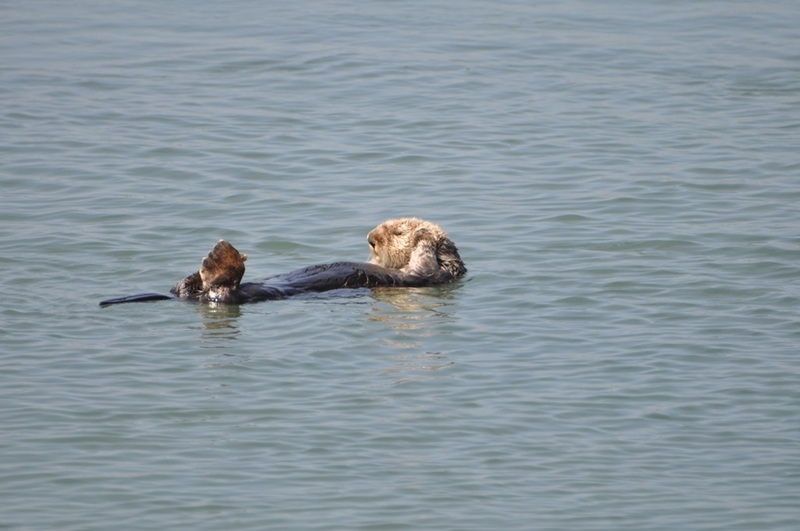 Take IOSF's latest otter quiz. What do you know about the different species of the world? All the answers can be found on this website! Go across to "Fun and Games" and give it a try! WE HAVE A WINNER! 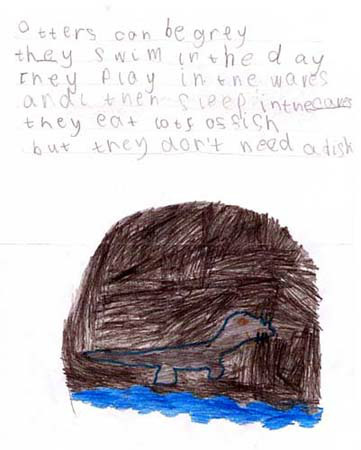 This is Grace Maclean's drawing of an otter, the winner of IOSF's otter competition. Swing over to Your Page to see who finished in the top 3 entries from across the world, who won our special Guatemala competition and check out their amazing artwork! Sofi and Noelle have moved from the nursery pen to the big pens on the croft. The picture may not be the best but shows Sofi checking out what will be her new home for the next few months. Noelle was a bit camera shy as she ran and hid in her box. 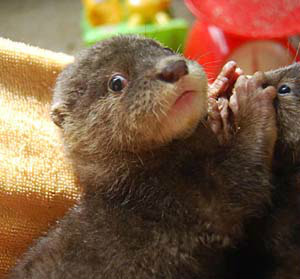 Their new home allows them to live more like wild otters and learn how to be a bit more independent. This is the last place they will live before they leave for the wild and the perfect final step before their release. Look who appeared on one of IOSF's camera traps. This week is Sea Otter awareness week - 24th-30th September 2017! Let's all join together and raise awareness for this beautiful otter. This guy may be covering his ears but we would love to hear all about how you are celebrating Sea Otter week! Email ben@otter.org and tell us all about what you have done this week. Thanks to Tabea Lanz for the photo. 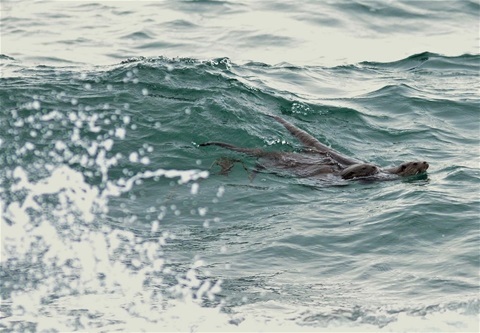 See how these two Eurasian Otters from the Isle of Skye swim effortlessly through the waves. 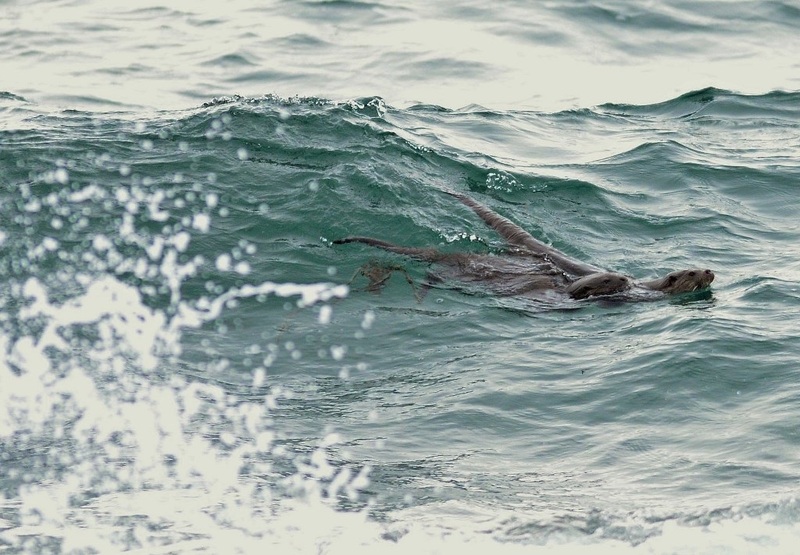 Otters are very strong swimmers and even big waves like these are no match for them! Thanks to Stewart Dawber at Skye High Wildlife for the photo. 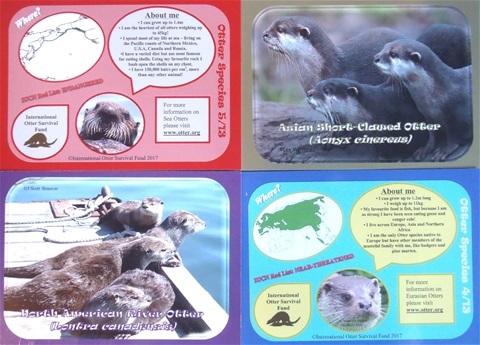 IOSF has just launched their new otter cards. There is one for every species and great to learn more about where they live, what they look like and how big they are. You can collect one at a time or get all at once. Simply click here to see more and start your otter card collection! On Friday 8th of September IOSF received an email from Manon Tissidre in France. She had a couple of otter cubs and was asking for some advice. As always, IOSF is delighted to be asked to help in such cases and offered some guidance to help the cubs. Happily, the two cubs are doing well thanks to the good work of Manon. 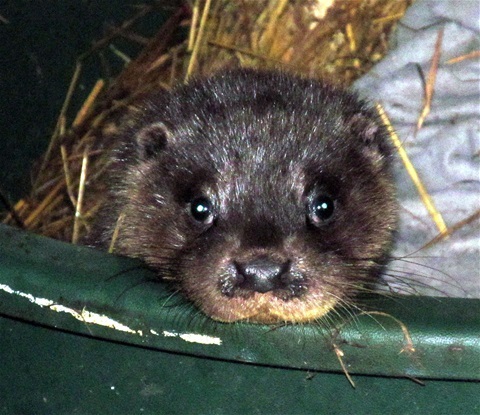 After finding the first otter cub near Clachtoll, Scotland, a second cub was found in the same place! After a week apart the brothers have now been reunited at IOSF's sanctuary here on the Isle of Skye. Ernie, the first cub, and Jenson will spend the next 12-15 months in the care of the IOSF team before being released back to wild where they were found. IOSF would like to thank everyone involved in getting the two cubs to us. Welcome to our newest arrival who arrived last night at the sanctuary. 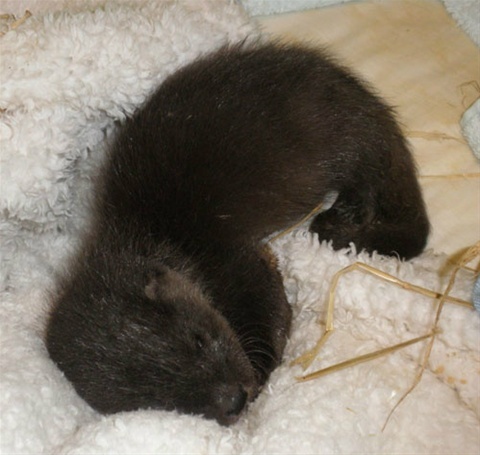 This tiny cub had been found running around beside the road at Clachtoll, near Lochinver, in north-west Scotland. 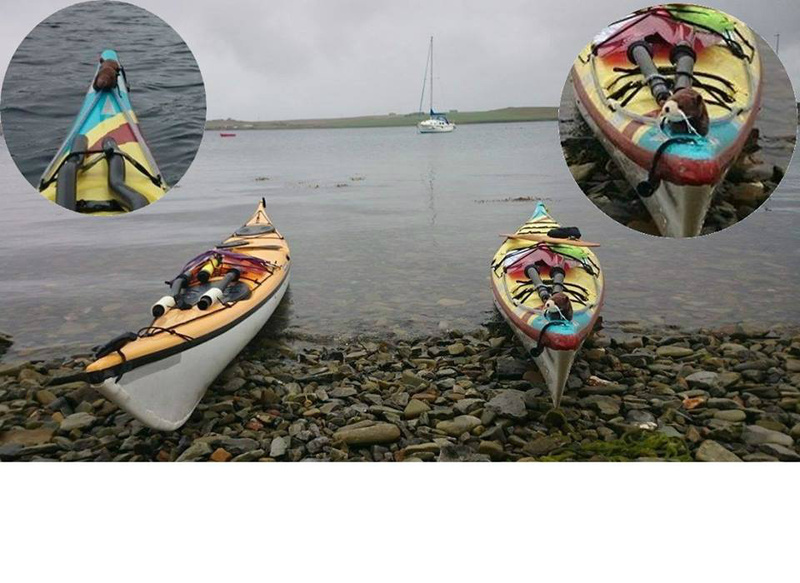 Thanks to Clarinda who found it and Andy, Noel and Jackie who helped to get the cub to us on Skye. Thank you to Monkton Park Primary School for raising a superb £119.73! The "Otter's class" managed to raise money during a produce sale using various fruit and vegetables that they had grown throughout their school year. 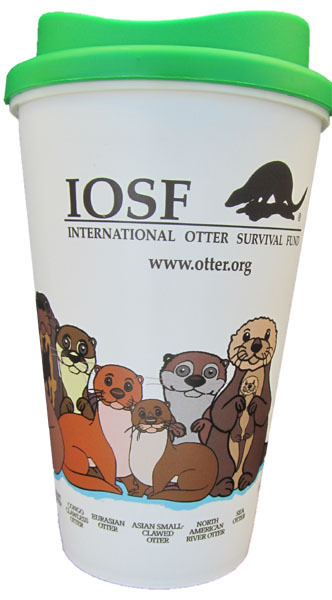 Given their name they decided to donate the money raised to the International Otter Survival Fund. So a big thank you to everyone at IOSF! Sea Otter's are most famous for eating clams and other shellfish but sometimes they like to go for something a little bit bigger and a little more dangerous. Octopus are not an easy thing to catch and often kill predators but this brave otter was hungry for a protein-rich dinner. 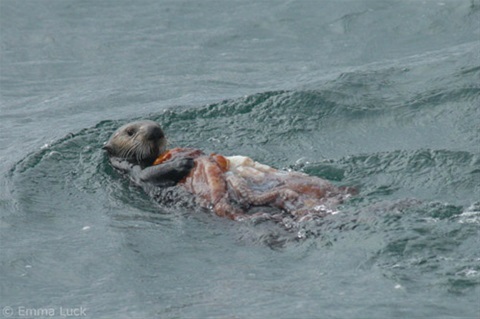 Check out this photo of a female Sea Otter showing off her latest catch, a Giant Pacific Octopus! The wee soft otter that keeps us company in the office is having great adventures on the high seas this week. 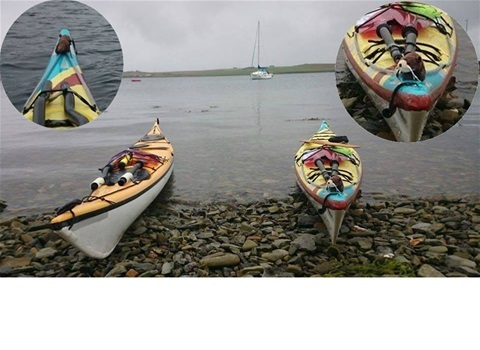 He has gone kayaking in Orkney with Helen and is having a wonderful time! What are your toy otters doing this summer? We would love to see some pictures! Sometimes you put out your camera trap to see what's hanging around your garden and you spot something very rare! 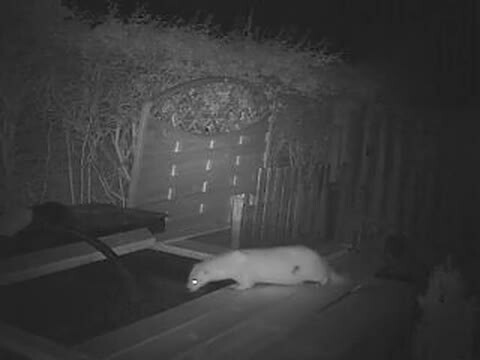 Graeme Gebbie, Kilmarnock, Scotland, had exactly that as he caught this video of an extremely rare albino Otter in his garden. After spending over a year in the care of IOSF at the rehabilitation centre it was finally time to say goodbye to Ganga. It may have taken us over a week to catch her as she hid among the pond, showing she truly is wild, but we managed to catch her today and set her free. 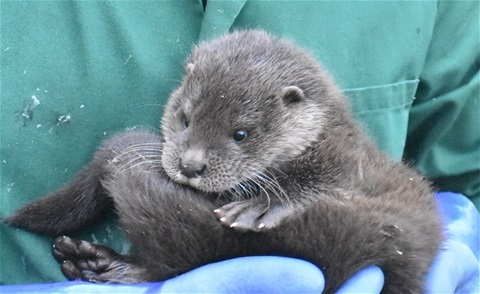 The best thing about being involved in rehab of Otters is at this moment when you can let them go and be where they belong. 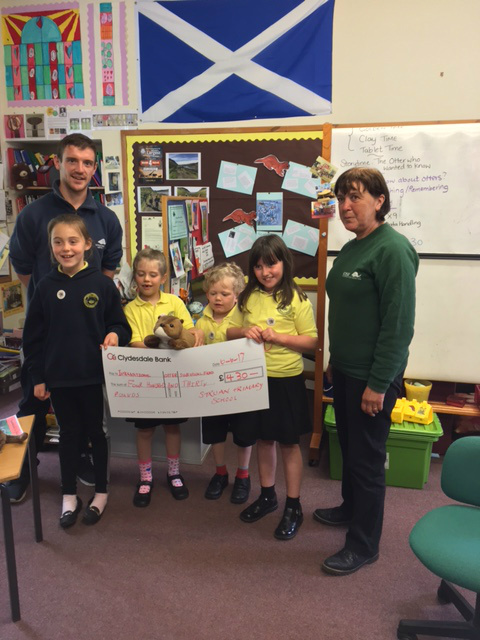 As part of Walk for Wildlife, Raasay Primary School decided to raise money for the International Otter Survival Fund. Here they are dressed up in their self-decorated otter masks. 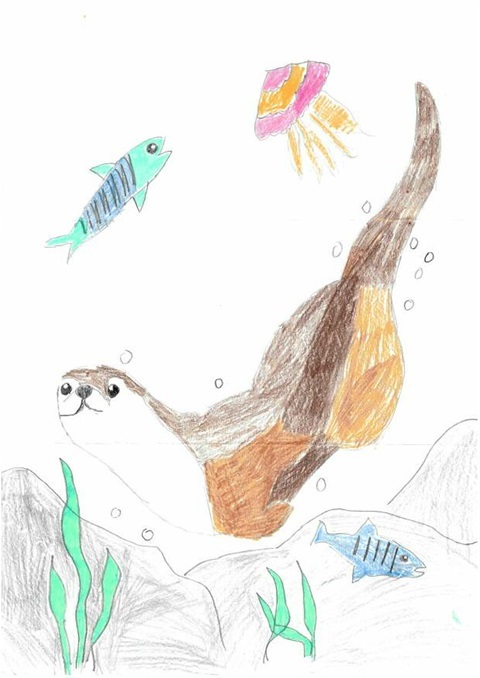 Raasay Primary raised a superb £96.83 for otters! 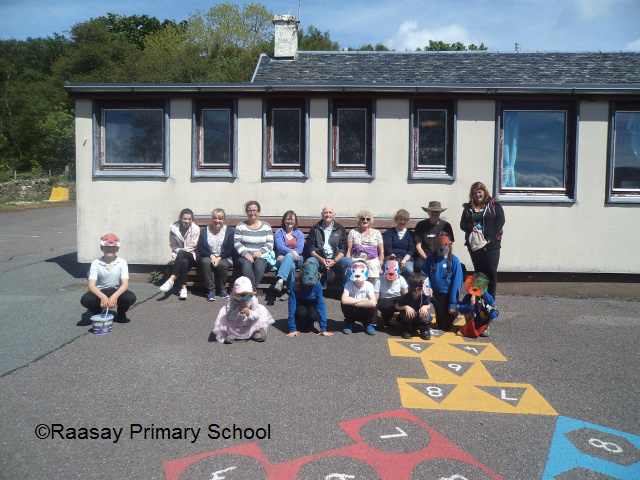 Everyone at IOSF would like to express the biggest thanks to everyone at Raasay Primary school! Fathers Day is just around the corner! Why not treat your Dad to IOSF's Otter Adoption pack for Dad? The perfect gift this Father's Day for Dad and for Otters. As part of the Walk for Wildlife, Struan Primary school based on the Isle of Skye decided to raise money for the International Otter Survival Fund. 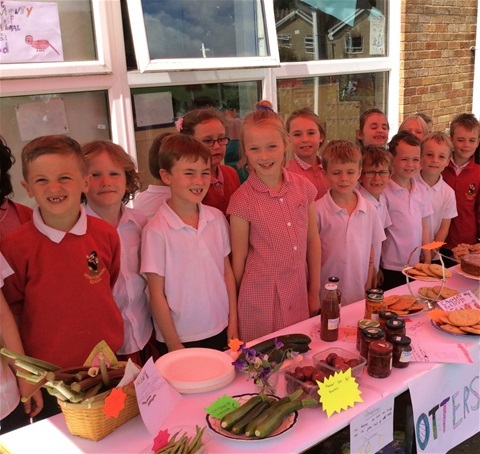 A small primary school, containg only 4 children, managed to raise a massive £430. 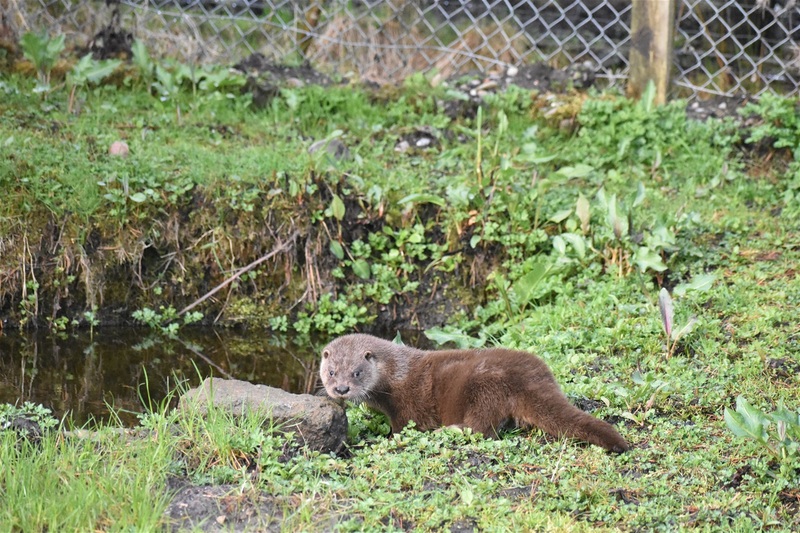 On Tuesday 6th June, Grace and Ben from the IOSF took a trip to visit the school and give the children a chance to learn more about otters of the world. Spending the afternoon with Sophie, Dexter, Vivienne and Alex it was great to see their enthusiasm and knowledge on otters! So a massive thanks from IOSF to Struan Primary school, keep up the good work! World Otter Day - 31st of May 2017! As part of this years World Otter Day people around the globe chose to raise awareness of otter conservation! 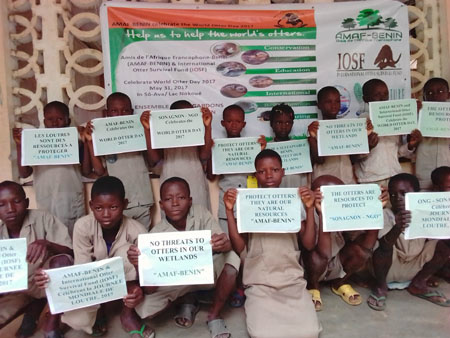 In Benin, pictured, Fataï Aina of the Amis de l’Afrique Francophone (AMAF-BENIN) celebrated World Otter Day in Sô-Ava on Lake Nokoué by holding an education day for 300 schoolchildren and 14 teachers. 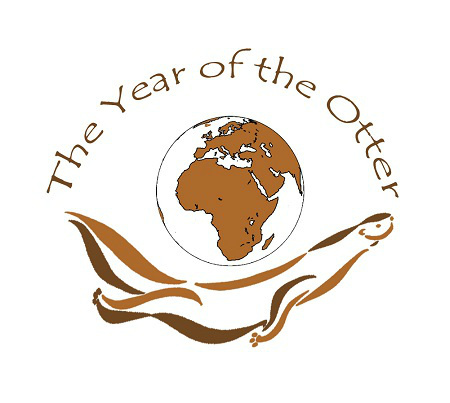 All over the world people were raising money and awareness for our aim to help otters all over the world. What did you do? 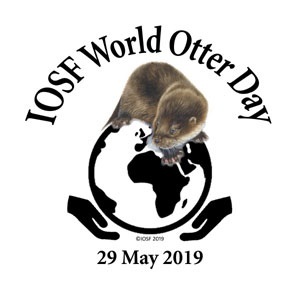 If you haven't already told IOSF how you celebrated World Otter Day we would be delighted to know! Meet our two latest cubs. Sofi, on the left, was found only about 400m from our house but we have no idea how she lost Mum. Noelle came to us all the way from Peterborough in England as no-one was able to take her in. They are both doing well and are in a nursery pen together - they are the best of friends. We hope everyone has a wonderful Christmas and Santa is good to you. Check out our Blog to read about the new cub in the sanctuary. Come on all you Team Otter fans. Get involved in this special Year of the Otter. We want everyone to be involved and we will post things here for you to do. 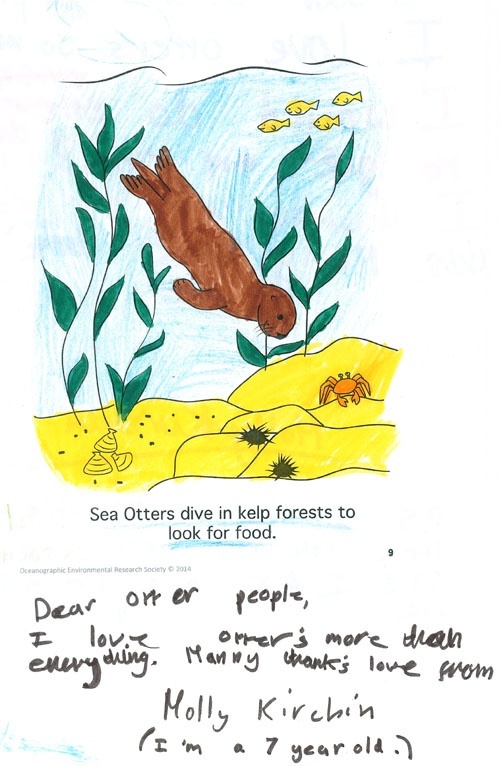 But we know you have lots of ideas on how you can get more people to help otters. You can raise money, or tell your friends, write poems, make pictures. All sorts of things. This is our winner of the colouring competition. Well done Holly. We were delighted with the number of entries and it was really very difficult to choose a winner. 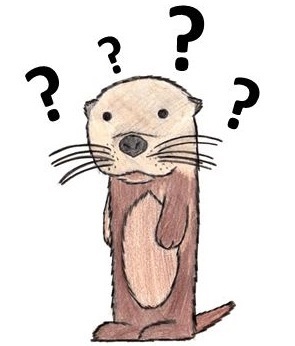 So we decided to send everyone an "I Love Otters" badge. Keep your eyes open for the next competition. 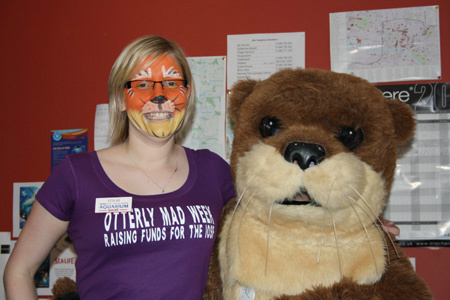 This page will keep you up to date with all ottery news. You can also check out the IOSF Blog and our monthly e-updates. So what are YOU going to do to help otters on International Otter Awareness Day - 27 May 2015? Make some cakes and sell them to friends at school - ask your teacher first! So get your thinking hats on and come up with something otterly brilliant. But remember always to check with your parents first. but they don't need a dish. Here is a picture by Oliver Thompson, from Swansea, who is also aged 8. In the sea I suddenly spot, a miniature brown dot. When I lean forward and squint, my head says take the hint. It is brown furry and in the sea, its an Otter I see before me! The creature's head turns and at me he looks, so in my hand I check in my books. By the photos and colours in front of me, finding him is easy. He is a Sea Otter! everything was calm and silent absolutely no commotion. The man stepped out of the cabin and walked along the pier. He saw me and said hello my name is Tim. I replied and said have a good day, then he walked away. 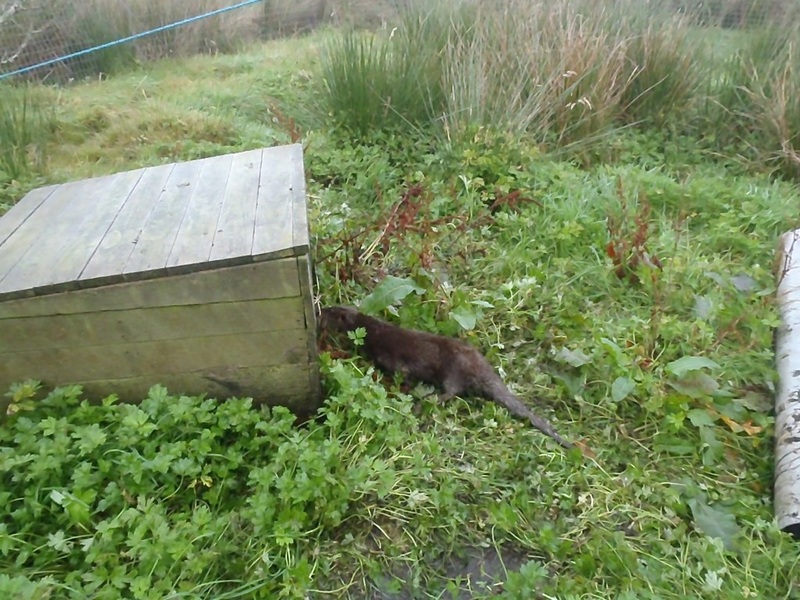 When I turned back the Otter had emerged. A clam he held in his hand. I watched him from the land. He swam over to Tim's boat and hit the clam on it. I saw the shell crack a little bit. He hit it again, success with this one. He ate the insides and then he was gone. Here's a poem I wrote for nature....Hope u like the poem...the poem I wrote is very near to my heart....I love otters such a cute, innocent animal killed for greed by us. Hope IOSF works more for saving otters help their number increase on planet earth. 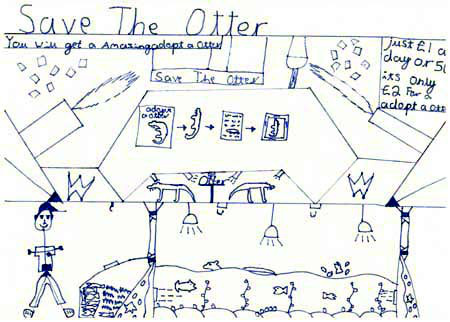 Thank you Varun, that is beautiful and we will certainly keep working to help otters. It is great to see you are so passionate about otters and nature.